The latest sheet from AIMS is this one on Commonwealth aircraft that were called into service in Korea. Unless noted, the aircraft were in unpainted metal. 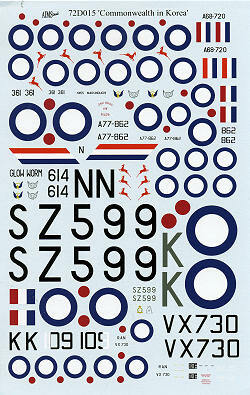 Finding kits for these will be quite easy as there are nicely done ones for all subjects. The sheet is 1/72 scale. First is a F-51D from 77 Sq RAAF. These aircraft were part of the 35 FG USAF in 1950 and operated in ground attack. Also used for ground attack were the F-51Ds of 2 Sq SAAF. These were attached to the 18th FBG in 1952. 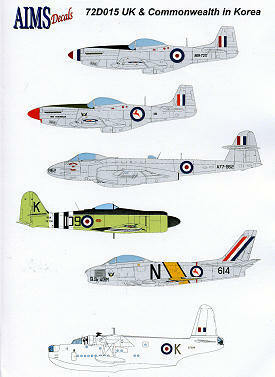 Shedding their Mustangs, in 1951 77 Sq returned with Meteor F.8s hopeing to operate them in the air to air role. It was found that the performance just wasn't there to battle MiGs so much of their operation was in ground attack. Next is a Sea Fury from 805 Sq RAN aboard the HMAS Sydney in 1951/52. 2 Sq SAAF also converted to jets, but in their case it was the F-86F in 1953 along with the rest of the 18th FBG. The RAF participation was limited to the Sunderlands of 88 and 209 Squadron with a former aircraft depicted on this sheet. A fine sheet with a number of interesting options. Thanks to AIMS for the review sheet. You can find this and other products on their website. These sheets are also carried by Hannants in the UK.